The material contained here has been collected from a number of sources, and includes verbal, written and published material. Moreton Sugar Mill - Sweet Heart of Nambour by Berenis Alcorn and Robin Dunn has provided much of the information about the early days of the sugar mill and its tramways. In addition, the microfilmed copies of the weekly newspaper The Chronicle (after December 1922 The Nambour Chronicle) held in the Maroochy Public Library in Nambour have provided details of events as recorded at the time. Personal assistance has been provided by John Knowles. The monochrome photographs reproduced on this website are from the archives of the Mapleton State School. The sources of most of them are unknown. If any person or organisation owning copyright on an image wishes it to be removed from this website, they should contact the author and advise him so. Trevor Robinson of Palmwoods has worked for many years in researching the tramlines that were constructed by the Moreton Central Sugar Mill, and has cooperated with the author in walking over and mapping the Mapleton Line in particular. Aerial photographs taken in 1940 have shown us the Mapleton Tramway as it then existed, and recent satellite photographs provided by the Maroochy Shire Council have been compared with the aerial photographs and then checked on the ground to build up a route map with a precision better than 10 metres. Thanks are due to the team in the Council's Mapping Department, Laurie, Sally and Narelle. 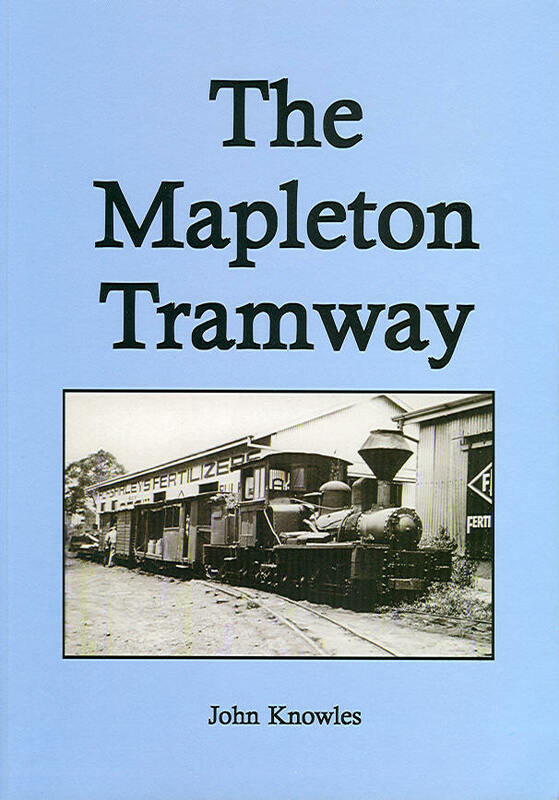 To obtain more detailed information about the surveying and construction of the line, its route, rolling stock, operational details and economic history than is given here, we suggest that you purchase the book "The Mapleton Tramway" by noted railway author John Knowles. This excellent 92 page book is illustrated with many historical photographs, line drawings, maps and aerial photographs. It may be obtained direct from the Australian Narrow Gauge Railway Museum Society (ANGRMS). Write or email ANGRMS Sales, P.O. Box 1135, Woodford, Queensland, 4514, or telephone (07) 3273 2014 at evenings or weekends. The cost is $28.50 plus postage and packing. It is also available over the counter from selected newsagents and bookshops. and from the Light Railway Research Society of Australia (LRRSA). To enable the reader to locate many of the remnants of the Mapleton Tramway, cadastral maps are included on this website. The maps are from the Department of Natural Resources and Mines of the Queensland State Government, and are Copyright The State of Queensland (Department of Natural Resources and Mines), 2005. The Department of Natural Resources and Mines gives no warranty in relation to the data (including accuracy, reliability, completeness or suitability) and accepts no liability (including without limitation, liability in negligence) for any loss, damage or costs (including consequential damage) relating to any use of the data. To these maps have been added updated data (streets and housing allotments) by the Mapping Department of the Maroochy Shire Council. These additional data are Copyright Maroochy Shire Council, 2005. The Maroochy Shire Council gives no warranty in relation to the data (including accuracy, reliability, completeness or suitability) and accepts no liability (including without limitation, liability in negligence) for any loss, damage or costs (including consequential damage) relating to any use of the data. User Licence No. USR:2005/979 has been given by officers of the Department of Natural Resources and Mines, and the Maroochy Shire Council, permitting use of the maps on this web site, provided that they are uneditable PDF (Portable Document Format) files. Adobe Reader or Adobe Acrobat Reader will be required to view them, and is available here. Aerial photographs taken in 1940 have greatly assisted in fixing the position of the tramway on the cadastral maps. They show the line quite clearly as it then existed, four years before closure. These images were taken from a height of 12 700 feet (3871 metres) in overlapping east to west passes between 10:49 and 10:51 am on 8 July 1940, a Monday. Close inspection will show washing on the clothes lines in the Nambour backyards - Monday was washing day! Permission has been granted by Geoscience Australia, owner of the copyright on these photographs, for a selection of them to be used on this website. Recent satellite images of parts of the route are also provided. These images are used with permission from Space Imaging. The term 'waggon' refers to four-wheeled road vehicles, 'wagon' refers to items of railway rolling stock. The four-wheeled swivelling mechanisms under the ends of long carriages or Shay locomotives are referred to as 'bogies', the term 'trucks' being used for the small four-wheeled items of railway rolling stock, e.g. 'cane trucks'. The names in italics, Dulong, Mapleton and Shay are actual names of individual locomotives, as distinct from the names of the districts of Dulong and Mapleton, and the generic locomotive type known as a Shay. When place names are used in a historical context, e.g. Thrush's Road, they are so spelled, but if used in a present day context, the apostrophes are omitted. This is due to a government directive of 1994 which deleted apostrophes from Queensland place names. Items written by third parties, such as newspaper articles, official reports, and personal reminiscences are contained within double quotation marks. In addition, major extracts from newspapers and some other sources are indented. Errors of spelling, grammar or punctuation from these sources have only been tidied up where the sense demanded it. Sums of money quoted in the years before 1966 are given in pounds, shillings and pence. They are not generally converted into dollars because of the effects of inflation. Measurements are given in units, either imperial or metric, that are germane to the situation and timeframe being discussed. Occasionally, alternative units are included in parentheses for clarity.